There is no doubt that cracker's always tend to be one step ahead of software creators, no matter how tough the software protection is they always come up with a method to bypass it sooner or later, But, Adobe seems to be very unlucky with their CS4 product release, first it was the Photoshop CS4 leak and now Adobe Creative Suite 4 got cracked and keygened within three days of its initial release, massive sized trial version of Adobe CS4 suite with crack patches made their way on torrent portals and file-sharing websites within days after release. 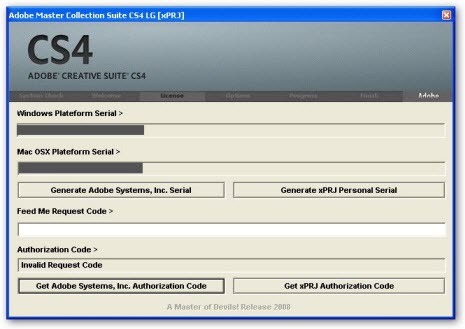 Adobe CS4 makes use of a license activation system to make Keygens and shared serial-number obsolete by blacklisting them via a central activation server, Surprisingly, smart crackers defeated the whole CS4 activation system using a simple trick, blocking access to the activation server using Windows or MAC HOSTS file. After generating the key using the keygen, users simply need to block access to Adobe Activation servers using their firewalls or Windows HOSTS file, effectively disabling the CS4 licensing system from verifying the registration serial-key. UPDATE # 1 : My web-hosting and domain service provider have received an copyright abuse complaint for this news post which actually does not contain anything illegal, we do not support piracy in anyway and therefore I am appending our standard caution notice for such post. CAUTION: Downloading and using any leaked build or any hack/crack is not only illegal and a crime punishable by law, but also pose great security risks and should be avoided. The information posted here is for news purpose only and any illegal links posted in comments will be deleted. Images Via Google Image Search. this is how mine is currently working. Same thing works with CS3. It is funny how much these idiots get paid to make these dumb activators, and we block them with WINDOWS. Wonderful. i know this is going to make me sound like an idiot, but wheres the download link for files on this site? A little FYI, we dont care if you crack our products. We make our money off of Organizations. We could make it impossible for you to use them, but then thats giving a giant advantage to our competitors. Thanks for calling the developers idiots instead of tanking them for all of their effort in such awesome softwares! I know that I am a person who also has to search everywhere to find programs to use because of the prices on the shelves and so forth and can understand when another uses the same tecniques I do to obtain the software and that it is wrong of us to do so, given the regard that not all people have the funds to buy said products. But I do agree with you, Adobe's software is one of the leading software brands in designing and development of graphics and so forth and I give them a 10/10 for that. I enjoy creating and designing things such as websites and so forth and Adobe has done an excellent job in creating such software. 1 000 000 thumbs up to Adobe!!!! If this is true then why not have a free home version or a cheap home version ?? Then why did the host for this very website get a copyright notice from Adobe? Plus, I highly doubt you are their employee. can you tell me how to do it? Can you give this idiot a step by step on how to download and use the free CS4? Should I bother with my host file? I found and downloaded/installed the CS3 Master Collection and the install worked flawlessly! The file included a text file with several serials that I put in at the start of install. I was never asked for an activation and it has never tried to activate. I've checked my hosts file and it was untouched except for one non-related entry. My question, should I even worry about adding the activation. *****.com to my host file or leave well enough alone? As long as everything is working fine do I need to worry about it? I always check my task manager and kill the FNPlicensingservice when it pops up (usually at initial start up and every time I run one of the Adobe programs) and I never use any of the programs while I am online - always disable the internet every time I use any of them, just in case. Would you bother? Thanks for any info. It'll be a challenge, but...oh wait, that was easy. Cheers to the hosts file. Windows itself is to blame for allowing such a method of exploit. We merely flipped the switch to the machine. well, "they" did. i've never cracked, per se, with software activation. First, the hosts files works the same way on the Mac. And on both systems, is has a lot of very good uses. I personally use it to redirect urls to localhost so I can do host header detection in IIS. It's poorly designed activation scheme created by adobe that's the issue. LMAO @ how they blocked the adobe servers, sometimes it takes simple to create genius! Did anyone answer the "how to request" I need same help. Separate problem. I was able to load and install on xp computer. My visat laptop gets :operation failed" during certain portions of install. So I Know the programs works but what is blocking on my vista computer. Also as stated how do you run disabler??? Can ne1 tell me where can i get this from??? Adobe - will you ever learn? Very smart! I love it! Adobe could easily solve issues like this just by lowering their prices so that individual users could actually afford to buy their products! If it cost $500 to purchase the Design Premium Suite, instead of $1700, or $99-199 to upgrade instead of $599-799 then people wouldn't need to try to get around the system. Thanks your help from this cash challenged user! they might sell more too, more sales at a lower cost than less sales at a higher cost. I can't seem to get this to work correctly - what am I doing wrong? how to block the windows vista host? it seems its not working? how to block the windows vista host? it seems its not working? please help. i want to know and learn. i've tried everything but the 'block' technique doesn't work on my vista machine . . . hosts file doesn't need to 'block' as expected, not does adding it to firewall. Any ideas what else to do on vista machines? Topnotch, valuable posts here. I'm wondering if there are any valid, working keygens for Photoshop Elements 7, Acrobat Pro Extended, Audition 3 and Captivate 3? Double Click and open it with Notepad. This should fix your problem. cannot create the C:/Windows/System32/drivers/etc/host file. make sure that the path and file name are correct. In order to edit and save the Hosts file go to \start\All Programs\Accessories and right click on notepad and select run as a Administrator open \Windows\System32\Drivers\ETC\Hosts edit the file then you can save it. Hello I tried the above but it's still giving me the "make sure the path name is correct" error then changes it over to a save as...any suggestions? I am using Windows 7 and having been trying to add -- REMOVED -- to Hosts file, but it keeps saying access denied. Could you please help? You have all my respect, man. Finally got my HOST edited. I hope it sticks. one more satisfied customer. thanks! The activate.adobe.com file is already on my computer, but I still can't open any programs to enter the serial number. (Windows Vista) What do I do now? I have had Adobe Flash Cs4 for a while now, with a keygen. But everytime I would reboot it I have have to generate another serial. No worries now though! Thanks! I've tried the above, it keep asking for activation. I've tried several keygen from the internet and failed too. Can someone pls help me..? I followed your instructions and changed the host file. I have windows vista.The serial number given doesn't work it says invalid key. I downloaded the trial version of PS C4 about a month ago. I followed the above instructions for my dell and tried adding the '-- REMOVED --' line, but it will not let me save the notepad file. It tells me the following: "Cannot create the C:\Windows\Systems32\drivers\etc\host file. Make sure the path and file name are correct." Also, when I enter the serial no. it will not accept it. I am not sure if it has to do w/ the fact that I saved PS in an external drive and not directly on my computer. Hey I followed these instructions to the letter and got this message cannot create the C:/Windows/System32/drivers/etc/hosts file. make sure the paths and file name are correct. whats missing? How do i activate dreamweaver and flash? I have activated photoshop and it still works, but the trial has expired for the others like dreamweaver and flash, it still asks for the serial number but CAN ANYONE TELL ME THE SERIAL NUMBERS??? Please, it's driving me mad! after i put in the serial number, the cs4 photoshop works. but when open the cs4 illustrator put in the same Serial number it is not correct number.what i should do? I followed these instructions, however i downloaded Photoshop CS4 directly from Adobe. When you initially start CS4 its going to ask if you want to do a trial version or if you have a serial number to activate. enter this serial number and I hit enter. It notified me that photoshop was going to contact the adobe servers to verify the serial #. I unplugged the ethernet cable and hit enter. It still worked! This worked a treat AND in Windows 7. Thank You. I'd kiss you if you were next to me. Previously, I can't use my Adobe CS4 while internet is ON as it will update to the adobe server and I will receive a message like license key is invalid. The next time I opened my CS4 it will prompted me a pop up window for activation. And now, it rocks! I have my internet connection ON and I no longer received the invalid license key notification. I've gone the www.blockdomainname.com route, but so far nothing I've done works. Do you have any suggestions? Can you provide the same step-by-step for a novice Mac user? Thanks for your assistance! Open up terminal and copy and paste the following command. Then add what you want to block. Then save and exit. You should then be able to activate it all with no problem. anybody knows how to fix this? I got a pop-up error message saying to reinstall or call ADOBe for assistance, or something like that. I restart win7 and Dreamweaver won't run. I can see it's process still running in the TASK window, but it won't run. So I uninstalled all adobe, deleted DIRs, ran CCleaner and even did some regedit cleanup manually. I reinstalled the whole macromediz CS3 package, ran the key gxnerator, and finished the install. Tried Dreamweaver -no dice and PS and Illustrator - no dice. If you did not receive any errors during installation, then perform these steps in the order given. 1. For an incomplete installation, follow the steps in knowledge-base document kb401401 (Windows) or kb402151 (Mac OS). If you received errors during installation, and you've never been able to open your CS3 application, then the installation is incomplete. Please follow the steps in Technote kb401401 (Windows) or Technote kb402151 (Mac OS). 2. Move or delete the cache.db file. Move the cache.db file from the following locations, onto the desktop or another folder. You can delete this file, but if you do, you'll need to enter your serial number the next time you open your application. Try to open your Adobe application. I installed cs4 on multiple machines at different dates. Now I am getting calls, that they have all expired. I put the date back and it seems to work again. But, I am thinking there is a Jan 20th bomb on all this. I was running little snitch and blocked the etc/hosts files too. Anyone want to look into this? If you get "License Expired" message while starting one of previously cured CS4 Products, just replace amtlib.dll once more (with the cured one) in that product folder and don't forget to add appropriate servers in your "hosts" file. Any questions - Google Knows. What appropriate servers do I need to add in the "hosts" file? I've been doing everything I read about on this site, including these instructions, and it's not working. I have the edited hosts file, set date back, opened photoshop, deactivated, opened again and entered new serial, set date back to today. For entering a new serial I've been entering one of several from a list of 11 from code tempest. I wouldn't expect any of the numbers would make a difference since with a properly edited hosts file this should solve any registration problem. to be able enter new serial. After that add adresses in hosts file, enter serial from @whattodo and everything is OK. Thanks it working back again for me after expired. Is this cache.db file available in Adobe Windows installation? How can I get rid of this license expired issue? I have heard on the grape-vine, that the host file does successfully work at stopping it calling home to activate, but that CS4 has a timer built in, so that if it hasnt called home successfully before a certain time, it will stop anyway. I have cleared out all preferences of adobe but it's still on the out. Cant find the file adobe PCD at all! but hows the "run as date" done? but with curernt date ? anyone has a new crack or command line in the hosts file to keep the current date ? as i know, "run as date" is just for windows, does anyone know equivalent for MAC OS? The modified .dll applied to all CS4 apps. worked like a charm. One day Adobe M$ et al will realise it is far better to produce and sell software at a reasonable price than to continually rip off people that cannot really afford their overpriced apps. such as research students. Thank God our universities give the knowledge to us to be able to reverse engineer and make these apps. FREELY available to the people that REALLY need them. Very best wishes to the hackers and crackers, you are a fine example to us all. the .dll did work, except for illustrator. It opens then immediately shuts down when the ide comes up. Any thoughts? Thank you. Worked like a charm! BEST SOLUTION IN THE WEB!! Awelsome! The best, you are fantastic! Guy, thank you so much!!!! works very well! Thank you so much, this worked perfectly. Cheers! it works! so simple to do..
very good, worked perfectly. But photoshop version (64) did not work, but the version (32) worked perfectly in windows 7 x64. edited hosts file, set date back, opened photoshop, deactivated, opened again and entered new serial,set date back to today. used the .dll in red_pill.rar mentioned above and replaced all the other similar dll:s and it worked like a charm again. is there get any thing such as the red_pill.rar for mac? Thanks for the dll fix. I got it from a keygen, only tested it with illu so far but that seems to be working. Hope that helps and thanks to all the others who helped! Where is the dll fix for Photoshop CS4 64bit? Hey, struggling with this whole cs4 thing. Could you please send me the dll also? Can you please explain the fix, as I'm in the same situation... thanks! Please send me the link or the .dll file. anyone for a method for mac ? any dll to fix acrobat 9 pro within the Master collection cs4? edited hosts file, set date back, opened photoshop, deactivated, opened again and entered new serial, set date back to today. Do you mean after done what you said and it will not expired after close photoshop and reopen it with the today date? This solution worked for me 2! It workxx on my MAC! 6: reopen flash and entered new serial. what are they steps to get TO the host file/edit it? Forgive my stupidity, where is the host file and what do I edit it to? What do I put in it? 3 - Hit return and type in your admin password. 5 - Save the file. Do NOT do a "Save As". Close the file. Hit return and exit out of Terminal. And how does one run a keygen on a Mac without having to resolve to running Windows on the same machine? worked for me too. THANKS!!! worked for me today (Jan 20th 2009) changed my date back to current and restarted a few times. everything works using the updated keygen link. i can't access the key generator????? It worked using the Chaitanya keygen! Many, many thanks to you! I did exactly as above, didn't work. Delete all adobe applications. Reinstall. Change date back and it work. Started the process above again, with the same error when i open a adobe apps. I tried to log in to get the Key Genreator but was ubable to access. Is it still available? would love to know how you did it? are you running a current date? Thanks for this, but after putting hte serial in Igot the same "License Expired" message. Where do I get a better serial ? I tried but I still get the license has expired message. Is there something I need to do besides the list of 7?? 1. No adobe PCD file. You guys are the very bests, (SOLUTION FOR: licensing product has expired) you the man. Thank YOU and keep up the good work! Same happens to me. Adobe Pro 9 requires a new Serial and the keygen doesn't work. Additionally, the complete CS3 suit (which is still installed on my computer) require a new serial too. It worked.. Great.. Thx all..
saved me from my work..
Any solution for Acrobat pro 9 requesting a SN? No serial number can be posted in comments. Acrobat Pro 9 serial number!!!!!!!! Your serial worked great, thank u boss! I just installed the cs4 cretive master suite for mac. Can anyone baby step me through how to get around the key problem? I tried using the firewall, but it hasnt worked and I dont speak enough computer to know my way around the terminal. PLEASE HELP! One of the things that I found myself getting into the habit of doing is opening Acrobat, going to the Help file and clicking the "Check for Updates" link. After it searches, I delete anything that shows up then click the Preferences button and remove the Automatically Check for Updates feature. I also remove all the check marks in the box below, just because I'm paranoid... :) I'm posting this from memory but it should make sense once you look at it. 2) Search in your Adobe folder the file: "dll"
FOR WINDOWS 32 AND 64 BITS!!! I spent hours of trial & errors until I got it working - glad it worked for you! look for post 108. serial in post 107. After trying every other solution listed here with no luck, this one finally did the trick ! Tnx a lot ! Thanks dude one thing if u could!? THE SOLUTION to the JANUARY 20 LIMITATIONS! 1) Perform a search in ADOBE using the PROGRAM files for: "dll"
and delete the file "cache.DB"
PLEASE NOTE: Steps 4 and 5 may not be necessary as it may messed up your filters and plugins. So, use steps 1 and 2, then use your firewall to block access to the adobe activation sites. If these dont work, set your computer date to January 19th, 2009 or earlier. Try this tool, might work fine. I have set all my programmes short-cuts to work to the 19th jan 2009 using Run as Date, placed all short-cut items onto the desktop and quick launch. I am back to how it was three days ago. putting dates back only works. However, if i do this, MSN messenger wont work. :( Any help for windows users? still expired when i reset the date on my mac! Can anyone please post the whole text edit that pops up, i accidently erased the whole text and maybe that is my issue? anyone have a serial for master collection for Mac? Can anyone give me steps as to how you deactivate it in the program itself? 2) Next go to "Help" then select "Deactivate". Hit continue when the warning panel comes up. 3) Next checkmark the box "Delete Serial From Computer Option" and hit okay. got all of my adobe master collection programs for MAC working. This thread is awesome! Can I allow updates to CS4 via Updater on Mac? On Mac, has anyone allowed adobe updater to install updates to CS4 when running with a modified hosts file? Is it safe to do so, or will this cause the software to get disabled? Basically, if I want to update to the latest software patches/updates/etc., what are the risks? If anyone has tried it and it does shutout the software, does deactivating and reactivating restore operation? Or should I just completely disable updater and stick with the vanilla version? I have deleted the cache file and added all the lines in the "host file"
But now i'm running into a problem. When i type "sudo dscacheutil - flushcache" it says "sudo: dscacheutil: command not found"
The lines like this one: "127.0.0.1 activate.adobe.com" are instructions to your computer to tell it that the server at activate.adobe.com is now located at internet location 127.0.0.1. The long list represents all the activation servers and this list points them all to this special address. What's special about 127.0.0.1? It is called the "loopback" address and means "my own machine": using this address basically tricks the software into trying to activate the applications by communicating with your own computer instead of the proper location of the adobe activation servers. Since your own computer won't respond to this request (it's not an activation server), the software assumes that the activation server is temporarily offline so it allows you to use the software in the meanwhile (since it can't just lock you out when you have a valid serial just because the adobe server might be offline). Now, the sudo line to -flushcache tells OS X 10.5 and higher to flush out any cached knowledge it has of the adobe server addresses, since entries in the cache could be used before the new 127.0.0.1 entries. By clearing the cache, you 'force' the Mac to use the new address. However OS X 10.4.x and lower do not have a quick command to clear the dns cache, but rebooting does the trick as well. Finally, the CS4 software does require that the activation server EVENTUALLY be reachable after a certain amount of time. This is why you eventually expire. So, at this point, you need to deactivate. This is easy: roll back the time so that the application does start, choose deactivate (and choose the option to remove the serial number completely from the computer). Now you are back to a fresh install. Move the time forward to current time, restart the software, and re-enter the key. Now the process starts all over again. Hope this helps you all to understand the process. wow amazing, okay so now how do we hack into the pentagon? ive been trying for the pat 2days! tried literally everything. ALL OF YOU ARE AWESOME. Have you tried quitting and restarting? It doesnt work. Of course the application is still running, BUT once you close it and try and open it again it says license expired still... well at least it does for me anyway. I have tried this fix, ive edited the host files and reentered serial numbers but no luck. One thing i cant do is delete my cache because i havent got an ADOBE PCD folder. Can someone please tell me how to find and delete the cache folder if i havent got a PCD folder, i'm on Mac 10.5. Or can someone aknowledge that the above fix does work for them when they quit and re-open because it isnt for me. You're probably looking in the wrong folder for the cache db file. It's not in the regular Adobe Program Files directory, it's in the common files folder in the Program Files directory. So far the only sure-fire method I've found is RunAsDate...it's freeware! Check it out! This works great ! Thank you very much !! I uninstalled cs4 master collection after I received the error "licence expired"; Now Im having a problem reinstalling software back on windows Vista system. Do you have any suggestions for reinstallation; what are the dependency CS4 files that I need to remove to do a fresh install? It really is that easy. (Look at post above - THE SERIAL HAS A TRIGGER) Tried a few others and they didn't work. But deleting the file cache.db and then entering a new serial number does the trick. Also, I do advise blocking the adobe servers, however you can also use Little Snitch if you are on a mac. http://www.obdev.at/products/littlesnitch/index.html (I'm sure there must be something similar for windows. It will tell you when a program is trying to connect to anything. Then you have the choice to let it proceed or not. ive just reset my time for the time being.. but i do not have an adobe pcd folder or a cache.db anywhere to found. ive searched my mac.. Funny how the first poster seems to be insecure about being a windows user, claiming that the workaround was somehow exclusive to WINDOWS users. Mac uses a HOSTS file too and it's exactly the same workaround. I went deep and reformatted and still no joy...date bomb! OK so I panicked and kind of needed a fresh system anyway, so I figured I'd wiped my hard drive, installed a fresh system (MBP Mac OS 10.5) and tried installing the programs 1st thing, before I had even connected to the internet for the 1st time. Totally disconnected. Airport off, no ethernet. That should do it, right? Nope. Still got the "license expired" message. I was truly baffled then...what kind of evil trickery could be going on?? But now the date bomb on the serials makes sense. I went ahead and rolled back to CS3, because I had to have the programs one way or another. Would this need to be done for each program? Would this just create another date bomb? I guess if it did I know the process for getting around it. Thank all that is good and holy I found this thread? I thought I was done for. whoops on the extra ? I run Vista and after making entries to the Hosts file the host file changes back in a few days, or maybe after a update how can I prevent this from happening? Rather than reverting all the way back to CS3, the quick fix is to simply roll back the date, launch CS4, then reset the date to current. I've been struggling trying to find a fix for CS4 which I rely on every day. The date fix takes 10 seconds, and works every time. So until I find a new Serial that has a new expiration date (or no date at all) I'll stick to this method... it seems the only sure fire way to go. Reset date on each use? So you have to reset the date each time you start up a CS4 program? That would get old pretty fast, but if the alternative is CS3 then I'll take it for now. When i close down the program, i have to reset the time to open it. Is this going to be standard to run this program with this work around? Why would the keygen be sucessfull for me with Photoshop CS4 and not Illustrator? I used the keygen for illustrator on another PC and it was sweet. Any ideas? You can either search in Google or just use bittorrent to download it. Can I get updates from Adobe? If I block access to Adobe activation servers can I still get updates? I've only found a crack for PS CS4, but I can't find anything for After Effects besides the X-FORCE keygen that requires the "host" block. Make sure that the path and filename are correct. Im using Vista, can anyone help? Look at this Video. Don't know if it works. It was just up loaded. You're really not that bright, are you? Why, oh why are you posting this link when it has nothing at all to do with this topic? FINALLY - I got Joy! On a MAC, i was still running into the same problem many others here were/are. After deactivating and entering the serial, it was still giving me "Expired" when i set the clock forward. It turns out it was TRULY my serial. I was entering a temp serial. I searched and downloaded a perm serial (after making sure my hosts are edited). This perm serial works perfectly. Now i don't have to reset the clock every time i use the apps. So... to answer the question "Would this just create another date bomb?". The answer is YES... if you use a temp serial - not a perm serial. WHERE TO FIND A MAC PERM SERIAL!? Is a PERM serial different from a keygen serial? How did you obtain a perm serial PLEASE??? Mine says 'Licensing for this product has expired'...? I have this problem too. Does anyone know how to fix it? I have the CS4 master collection, and I've ran into all the similiar problems as mentioned. Here's what I did to fix it. On my laptop there is a switch, it turns off the outside world (wireless switch) and turns on the creative side while having adobe open, when it's time to restablish connection to the herd, Adobe gets closed and the switch, (wireless) gets turned back on. Is there a workaround for cs4 web premium? Hi I am having the license expired problem with CS4 and I am afraid I don't understand this editing the host file and setting date back to reactivate it. I would soo appreciate it if someone could explain this to me super simply so I can use it again. Many thanks!!!! Sorry. I am on a Mac. Thanks! Can anyone please(i beg you) get me a Adobe Illustrator CS4 CD-Key. Oh god im craving 4 it man!! License expired REAL FIX on Mac??? Hey guys, when turning time back to 2009, all Adobe apps seize working. How many times does the answer have to be given! Use a perm serial... not one of the temp serials. Where do you get a permanent serial? I'm running Vista and so far I can't find any serials at all. Did all those things and everything is working again exept flash does not like to load any more. Does anyone know what the problem can be? This page is better that all blogs I visit in all my life. I've having my "Host" file changed twice after a week. I don't understand what is happening but it's deleting the "127.0.0.1 activate.xxxxx.com" line. Does someone has a solution? Acrobat requires a sep key - CS4 key is for all BUT Acrobat. I had earlier activated adobe by editing the host file. But now after a month it said that the license key used was invalid and asked me to obtain a new one by connecting to the internet. Has anyone else faced this problem? well i got it going on my laptop but its to slow so im using my dads computer witch is 10times faster then mine... well first i want thank who ever found out this problem..
sorry, this does not work on vista. I had the trial version installed. After the trial version had expired, I tried to install an Illustrator with a crack. But I can't install the program because no matter what serial number i introduce, it displays that the number is not valid and the process can no longer continue. What should i do? I just spent an hour reading this forum and there are only two answers to any of the questions. both slightly technical for people who don't know there way around there computer. so hear is this for total begginers. Search google for "iserial". This is a program that will help you get all the serials for all the programs you need. Now that you have Iserial you will also need a progam called "littlesnitch" . Now go to adobe.com and download the master suites trial. If you don't want to pay anything use a bit torrent site such as "mininova" to download the trial. I repeat the trial. 3. when installation is complete open any cs4 program and when prompted to either insert a key or continue as trial. Insert one of your keys. 4. evrything will work fine. in iserial you need to look under the creative suites to find what you need. Okay? okay. I get a message that says product has expired. 6. dial the date back refers to your actual computers date. change in system settings or in preferences. 7. follow instructions listed again and again in previous posts. Don't install Little Snitch just for this program. All LS will do is update your host files for you. Simply update your host files yourself and don't install a heavy overhead app. And don't mess with the clock crap. Just use real serial and not a temp serial. Duh! SET YOU DATE AS FAR BACK AS 2006 IF YOU WANT THE DATE ROLE BACK TO WORK!!!!! Thanks for the dll fix!! I tried all the other methods with no good result. But the red_pill did the trick for me!! The dll. fix did it for me also. Having done the delete cache,clock rewind,new serial no.,deactivate, etc., i thought that i could accept doing this every 30 days for a fresh trial install but, the license expiry notice did become a pain. Yesterday i tracked down the dll crack and used it to overwrite the original and BINGO! a full install. Happy bunnie am i. Many thanks to all you guys for taking the time and trouble to post a geat workaround to the Adobe 20th january time bomb. "A problem occurred while extracting some files. Check available space on your computer and the write privileges on the destinatation folder." my disk space has a free 20GB and i don see the problem here.. i off all firewalls and i changed my virus protection on ADBEPHSPCS4_LS1.exe to be allowed. as u can see, I don need the entire suite. so what do u recamend me to do? I mean, do I use a keygen in every single cs4 product? and if it like this, how do I do the host thing? and also, what about this .dll archive that people mention in other web pages? I'd be really grateful if u helped me with this ,u know... the best way to get these programs and have them working perfectly! regardless, is anyone familiar with this prompt, and if there's a way around it without having to reinstall photoshop cs4? Please help, i have followed all the steps above, atleast the illustrator stopped telling me to contact the sys admin, but it shuts down immediately after start up. I had previously cracked it and it was working well before it started showing me the error message to restart my machine and contact adobe. After downloading CS4, I was bugged by the licience expiration pop up, when I read the blogs on this site, I got a remedy: I blocked adobe Cs4 apps with windows firewall then I reset time back to 2006, it worked sweet. I already have a copy, just need to understand where to get a keygen and what changes I need to make then. adobe cs4 keeps asking for my serial!!! What would we do without you and cracked Adobe! I have a problem - I can load and run adobe cs4 but it keeps asking for a serial and i cant use one i typed in earlier so i have to regenerate one using your keygen. i'm worried this is gonna run out. I've tried to edit the hosts file in vista but it won't let me save in either wordpad or notepad. Is this because it won't list it's file type? PLEASE HELP SHADEYMAN!!! can anyone show me how to deactivate after i set the date back and re-opened the photoshop? As i can't see there is a button for me to deactivate??? Then It was taken down by adobe but the same person put it up again. With a different name. But it's the same video. If you guys want the CS4 Master Collection without using torrents then this is for you. It shows how to keep it longer then the 30 days. But you need to read the description for instructions on how to get the CS4 Master Collection. This guy rocks ! ! "the app failed to start because ambtlib.dll was not found. Re-installing the app may fix this problem"
I followed the steps, then re-installed but it still doesn't work. I got CS4 working fine using the host editing trick and cracked dll. - Thanks to everyone! As a precaution I also blocked network zones on my Comodo firewall (under host name). I didn't put in a www or any IP address. Will this work - would I be better putting in IP addresses ? I have an interesting problem that i can seem to bypass. I installed a pirated version of Cs4 Illustrator, Indesign and Photoshop, and the next day i got a call from my internet provider saying that i had downloaded adobe cs4 programs and that adobe traced it back to my IP address. So yeah that scared me a little, but i still need to use the programs for school. so i found out that flexnet has an anti-piracy initiative and can sense via internet activation who is using a pirated serial/crack/keygen. Which brings me to my question is there anyway to bypass the flexnet activation? When i reinstalled it after my internet provider told me to delete it i used comodo firewall to block its access to the internet. in doing so it wont work due to lack of activation hence the problem. Maybe im just not understanding the problem. I dont know. Change the ip in your browser settings to use a proxy. That might work enough to at least get it activated. Not sure, but it should bypass your isp. also i keep getting the adobe error code 148:3. How do i fix that. the flexnet problems are two fold. the first - flexnet as far as im aware cannot yet be bypassed so it has to be allowed to run. using the hosts trick does work. i disabled all the other adobe services including the licensing one and thats when i get the flexnet error - the service must be allowed to run otherwise cs4 wont. where is that "unique" dll fixter? Does this work for mac? I recently obtained this copy, and am unsure how to get it to work on my mac. What happens if I REGISTER with ADOBE? First off left me thank you all for a well put together forum I credit you all in helping me get this program. I would just like to know could you register your copy with ADOBE after completing this? I know it's a stupid question right? But no seriously it's not. It'll possibly cut out the hassle of having to go thru other measures when a new version comes out right? Um... the FBI shows up at your house? Do NOT update any of the software. By updating, you allow Adobevil to close the loopholes that all these methods use to get around licensing. If you want updates and proper support from Adobe, pony up the dough to buy the software. Do NOT register with Adobe. Unless you bought the software, NEVER EVER register it. This applies to all software, not just Adobe CS4. "Hi, I'm stealing your software, and here's my name and address so you can press charges... derp derp." Get a clue please. Hello, uh yeah so I got the serial number for photoshop off of here but I also want to get the rest of master collection. Where can I get the serial numbers for the rest of master collection? Thank you for your help. This process worked fine on my macbook pro but not on my new mac pro. serials work but it still asks to be activated. what am I doing wrong? hi, I've just install this cs4 and follow the above instruction editing host, and set back the date but it doesn't work. I've search in my Adobe and cant find this dll either. Can anyone pls help...? i launch any program, it asks me for a serial, and there, well nothing will work!! Fixing Error "Windows cannot start this hardware device because its configuration information (in the registry) is incomplete or damaged. (Code 19)"